This is the second consecutive year that I was unable to make myself available for shooting the colourful, beautiful closing ceremony of the month-long Kaamatan festival. Not that I don't support it nor that I've lost my passion for photography. I was away from home during both occasions. The last time I 'squeezed' myself in to shoot was in 2013 when Immaculate Lojuki was crowned Unduk Ngadau Kaamatan. Great experience. 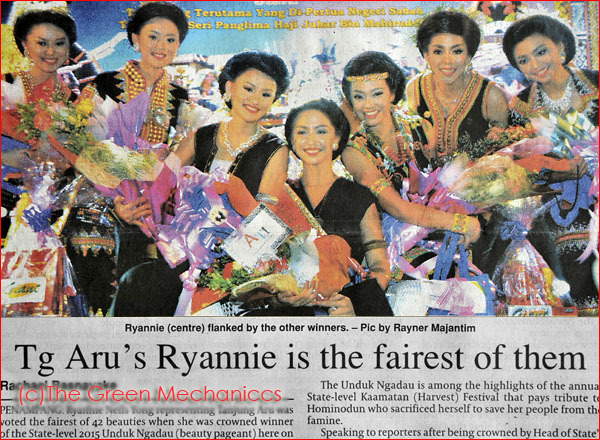 What I can share with you today is the result published by the local dailies immediately after the event. 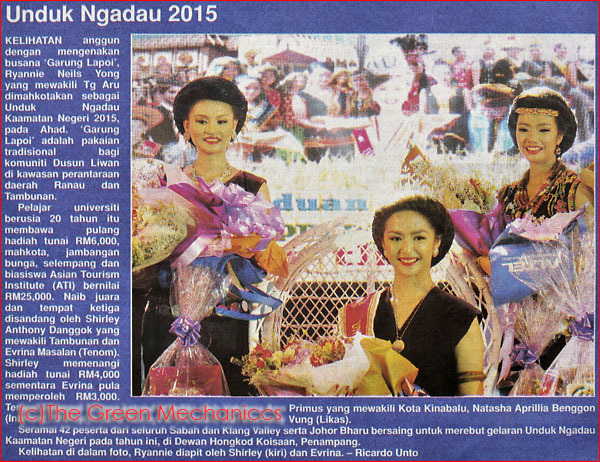 Ryannie Neils Yong (seated middle in the pic) representing Tanjung Aru - donning the Tambunan traditional costumes - was crowned winner of the State-level 2015 Unduk Ngadau Kaamatan. She took home RM6,000 in cash, a trophy and a crown, RM25,000 worth of scholarship from ATI, air tickets to London and Melbourne, 4D/3N Bali trip and a designer handbag. 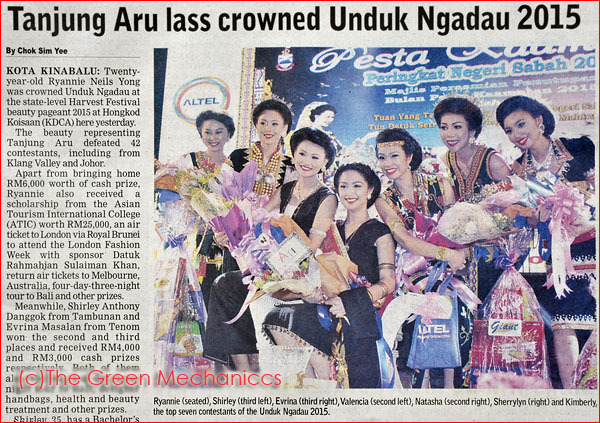 It is good that contestants took note of the Organising Committee's emphasis on choosing this year's Unduk Ngadau "that would not only be the best embodiment of Huminodun but should also have an in-depth grasp of the origins of their ethnicity and heritage", in their efforts to win the vote of the judges. I like the winner's back-to-basic approach in her costume selection. See you on May 31 next year, hopefully. I've missed so many Kaamatan celebration. But next year I'd definitely be back in Sabah. So, ya. Hopefully will see you too haha.